Thank you for reminding us to slow down and meditate on how great the Lord's love for us is! 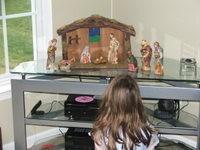 It prompted me to lay on the floor & take pics of the nativity that my Mammaw made back in '69. It is my most prized Christmas decoration -- I can't wait to scrap it!